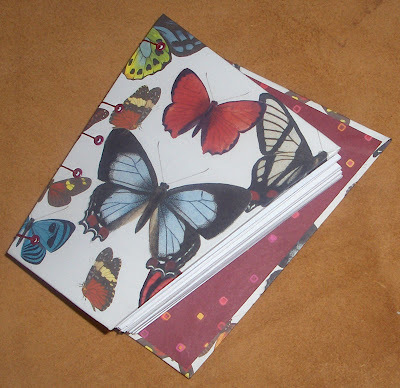 And finally, the last book to be featured from our second book swap is from Jen, of DeckledEdgeBindery.Etsy.com. Who says a book has to have right angles? In fact, every angle of this asymmetrical book is different! 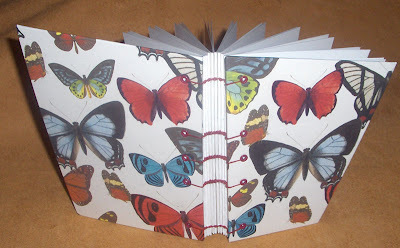 This hardcover, Coptic bound journal is covered with beautiful butterfly paper and sewn with red thread through matching red eyelets. Endpapers are contrasting dark red print and the book contains 96 pages of heavy paper. Visit Jen's Etsy shop to see more of her books. and I own it. As it sits on the desk by where the computer usually sits when I'm there. and a special thanks to Rhonda for hosting this swap event.